Femoro acetabular impingement syndrome, or FAIS, can cause severe stiffness in young hips, mimicking the arthritis of an older person. Hip and groin pain in the young adult may be caused by a growth on either the socket or the hip causing abnormal contact between the femoral head and the acetabulum at the end of the range of motion. This is caused by structural abnormalities known as pincer or cam deformities. This condition generally refers to too much coverage of the ball. Typically in the history of the patient's complaint we find it in the sporty younger person. Often they will have consulted their chiropractor for another condition; perhaps a neck or ankle injury. But it lurks, unrecognised, in the non-sporting individual too. During the physical examination it becomes apparent that there is distinctly reduced range of motion of the hip, with a hard end feel. They may then remark that they have indeed a stiffness in the groin, and even pain. Of course, as this patient ages, later in life he will present not just with stiffness in the hip but with frank pain in the groin, perhaps as the initial complaint, as the general public begins to realise that chiropractors are not only spine specialists, but of any and all joints. All except the joints between the ossicles in the inner ear. Those are the only joints I have no idea how to treat. What chiropractors have learnt about joints of the spine, can be applied to any such part in the body. Femoro acetabular impingement syndrome becomes prematurely arthritic if neglected; a simple set of exercises is part of the solution. Typically in Femoro Acetabular Impingement Syndrome there is reduced range of motion in flexion and internal rotation with a hard end feel. For me it still comes as a surprise to find marked stiffness in the younger person. For years I have associated hard end-feels in the hip with the elderly, and never even bothered in the early years to look for it in the younger patient. IF YOU DON'T LOOK FOR IT, YOU PROBABLY WON'T FIND IT, RIGHT? Google appears to frown on too many links, so phrases in bold, like hip pain questionaire above, need to be put into the Site Search function in the navigation bar on your left if you want more information. 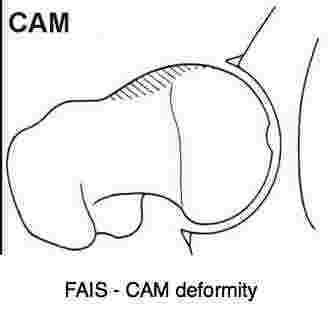 CAM - FEMORAL HEAD deformation;an abnormality at the level of the anterior head neck junction. PINCER - ACETABULUM deformation; a bony spur which increases the covering of the femoral head. Either way, there is increased contact between the acetabular rim and the femur. They produce subtle differences which may be elicited by the orthopaedic tests listed later on this page. The nett result in both syndromes is groin and hip stiffness; later there is progressive pain and degeneration of the labrum if the condition is not appropriately treated. Cartilaginous lesions form either along the postero inferior or the superior aspect of the acetabulum, limiting full range of movement of the ball in the socket. The end result is the same, if it is not correctly managed; osteoarthritis of the hip, also known as Cox arthritis. These new understandings help us to grasp why sometimes the degenerative changes in the hip are in the superior part of the acetabulum, and sometimes in the postero inferior aspect. Repetitive shock, particular in sport, between the cam deformity on the femoral neck and the wall of the acetabulum eventually may even result in an avulsion tear of the antero superior labrum with very sharp stabs of groin pain. In femoro acetabular impingement syndrome there may, less commonly, be decreased external rotation. Shortly we will see that they are really two different conditions that, for convenience, we wrap into one. In which case, Patrick's Fabere test will also be stiff and limited. It took me more than twenty years in practice to grasp the reason why there may be decreased internal or external rotation in the neutral position, but not in the flexed hip; or vice versa. 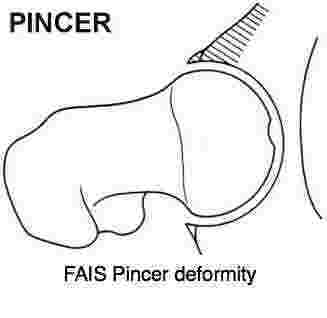 All this is typical of FAIS; and why a young person can have all signs of an arthritic ball and socket. Interestingly you can have limited external rotation, and a stiff Fabere test, but no symptoms. Then sixth months later, suddenly for some unknown reason usually, groin and hip pain begin. Here's an anecdote from the chiropractic coalface. A 23-year old woman presented with neck pain and headaches. During the general physical examination it became apparent that she had limited and mildly painful hip flexion, adduction and internal rotation, more apparent on the left. Can this early recognition prevent the inexorable deformity and pain that is likely to occur? Only time and research will tell. This week I was privileged to give a lecture on femoro acetabular impingement syndrome to a group of young adults; of the thirty persons present, at least five had significant abnormalities in their hips. This is not an unusual or rare condition. And, with early detection, I'm convinced that half the pelvic replacement surgeries could be prevented. The problem is that, like raised blood sugar where fully 50 percent of diabetics are walking the streets unaware of the disease that stalks their very lives, most persons with hip problems also have no idea that a total joint replacement is in the offing. This 63 year old woman has had mild pain in the groin spreading down the inner thigh towards the knee for some two years. The range of motion of the hip is mildly limited and painful. Interestingly, the radiologist called it a normal study. Who is likely to get it? FAIS and hip groin pain typically affects particularly the active, young person. The non-sporting person probably is unaware there is a problem until much later. The degenerative change is due to repetitive shock between the CAM deformity on the femoral neck and the labrum of the acetabulum. Patients often present initially with another condition. Perhaps a painful neck or shoulder. There is no pain and unrecognised stiffness in the hip, assuming it's normal. Only the thorough Chiropractic examination will recognise the abnormality. As they age, early twenties, they may realised that others can sit in the lotus position, for example, but they can't. Finally as the FAIS progresses to degenerative changes in the hyaline cartilage of the acetabular and/or femoral head, pain in the groin begins. CAM: Limitation of the hip ROM particularly in flexion and INTERNAL rotation. PINCER: Limitation of the hip ROM particularly in flexion and EXTERNAL rotation. 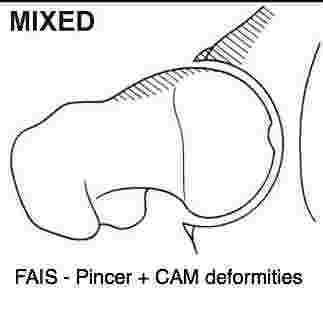 • 86% patients with Femoro Acetabular Impingement Syndrome have a combination of both CAM and Pincer. Both internal and external rotation, flexion and adduction are gradually and progressively more limited. What is odd is that sometimes the condition begins with pain in the groin, but no stiffness, currently with a 34-year old woman. X-rays have confirmed a Pincer deformity but she has a full and free normal range of motion. Presumptious perhaps, but one expects the stiffness to develop later... and the hip arthritis if the appropriate chiropractic management is not applied. That small ridge of bone, marked CAM on the femoral neck, jams repeatedly and forcibly up against the labrum of the socket, causing the hyaline cartilage to degenerate. Can Chiropractic prevent this inexorable progress from early stiffness to the severely arthritic hip? I believe so, if femoro acetabular impingement syndrome is correctly recognised and diagnosed in time. And the appropriate treatment is effectively applied. That would include daily range of motion exercises, adjustments if necessary of the sacroiliac joint, weight loss if need be and an anti inflammatory diet. Groin pain is a common feature of femoro acetabular impingement syndrome, and in fact all hip conditions. No one knows if Femoro Acetabular Impingement Syndrome is a condition that begins at birth (congenital) or develops during periods of growth (acquired). It's likely a combination of one’s genetics and the environment. Recent research in England 2010 finds a correlation between siblings, suggesting that it is hereditary. Has granny had a hip replacement? Some experts believe that overly robust athletic activity before skeletal maturity increases the risk of Femoro Acetabular Impingement Syndrome, but no one truly knows. Significant contact sports (eg. football) are associated with FAIS impingement. How is Femoro Acetabular Impingement Syndrome diagnosed? 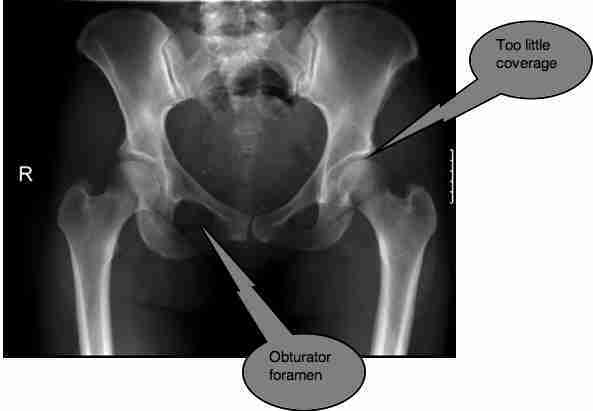 Orthopedic examination of hip groin pain. There is decreased flexion and rotation, and later adduction, with a hard end feel; a soft end-feel would point to a lesion in the capsule or muscle. The FAdIR test : If the hip and groin pain is reproduced in flexion and adduction with forced internal rotation of the leg at 90° of flexion. The FAdER test : If the hip/ groin pain is reproduced in Flexion, Adduction with forced external rotation of the leg, with the hip in 90 degrees of flexion. Posterior FAIS exists if there is hip stiffness or groin pain in forced external rotation with the leg in full extension. X-ray films are used to determine the shape of the ball and socket as well as assess the amount of joint space in the hip. Diminished joint space is generally associated with a greater chance of arthritis. The hyaline cartilage lining the bone has become thinned. Specific attention is directed to the head-neck region. Fullness or a prominence of this region laterally on the AP view is indicative of anterolateral disease. Often an MRI of the hip is used to confirm a labral tear or damage to the joint surface. The MRI is most helpful in eliminating certain other causes of non FAI hip pain including avascular necrosis (dead bone) and tumors. The anterior hip capsule is innervated by the femoral nerve. It is very common that femoro acetabular impingement syndrome refers pain down the front of the thigh towards the knee and sometimes the inner lower leg. DDH or developmental dysplasia of the hip is a different diagnosis to Femoro Acetabular Impingement Syndrome. DDH generally refers to TOO LITTLE coverage of the ball by the socket, whereas Femoro Acetabular Impingement Syndrome generally refers to TOO MUCH coverage of the ball by the socket. Because of the decreased coverage, hip dysplasia results in increased range of motion. It needs to be differentiated from "hypermobility" - general loose ligaments resulting in increased range of motion in the hip, but without the developmental changes associated with DDH. Too little cover ... this woman has pain in both groins, with no limitation of movement. We've caught it in time - there are no degenerative changes yet. 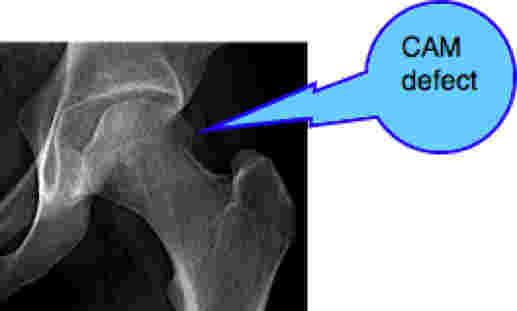 Both DDH and FAI are associated with labral/cartilage tears and hip arthritis. FAI and DDH may coexist in the same hip. Careful examination of the painful hip is needed to differentiate between mere hypermobility, hip dysplasia and femoro acetabular impingment syndrome - and sometimes a mixture of two of the above. This next case puzzled me until I saw the X-ray. In my defence it confused her doctors for five years. She's doing much better with Chiropractic Help. Can back pain be a sign of FAIS ? Yes. While the cause is not well understood, patients with Femoro Acetabular Impingement Syndrome often complain of low back pain. This pain is often localized to the sacroiliac joint (SIJ), the buttock, or greater trochanter (side of hip). FAIS pain typically does not go beyond the level of the knee. Fundamentally, abnormal biomechanics at one joint can and does affect other joints, primarily local, but also remote. Adjustment and management of the sacro-iliac joints. The Thompson drop protocol will usually be best. Lumbar roll techniques will often exacerbate the pain in the groin, and should only be used with discrimination and care, to avoid adduction of the hip which will cause groin hip impingement. The Derefield protocol helps decide whether to adjust the sacrum or the ilium. Mobilisation and adjustment of the hip joint. Stretching of the hip joint, and associated muscles, avoiding those hip movements that cause pain in the hip groin area. Deep soft tissue techniques of muscles with active trigger points. The Adductor Magnus muscle, the Ilio-psoas muscle as well as the fine hip rotator muscles are often involved in hip groin pain. This treatment may be extremely painful, and should either by lightly done, or only two or three deep strokes. Cross friction of the capsule in the groin, not neglecting the approximation of the Femoral Nerve and the Femoral Artery. Some chiropractors may choose to use needling, acupuncture and electrical modalities. Active rehabilitation of the muscles of the pelvis and thigh. Managed return to sport for the patient with hip groin pain is advisable, recognizing that competitive sports such as basketball and football may no longer be advisable if the congenital structural abnormalities in the acetabulum are significant. If you have hip groin pain it is possible that you may have to accept that only sports such as cycling and swimming are advisable. Your chiropractor will advise you. The alternative is early hip degeneration and consequent premature hip replacement. Weight control and a healthy anti inflammatory diet is important. Supplements such as glucosamine phosphate may help. Surgery may be recommended in extreme cases. Cortico steroid injections are used by skilled orthopaedic surgeons and may have benefit if injected in EXACTLY the right spot, however there is risk of tendon rupture. This week, a 55 year old woman with severe groin and lower back pain. The interesting question is: which is the primary? Mrs J has had debilitating lower back pain primarily in the sacroiliac joint, and really quite severe groin discomfort. The presumption with groin pain is that the patient probably has hip arthritis, but no, the range of motion of the hip was only marginally limited, but the capsule was extremely tender on palpation. X-rays revealed all. 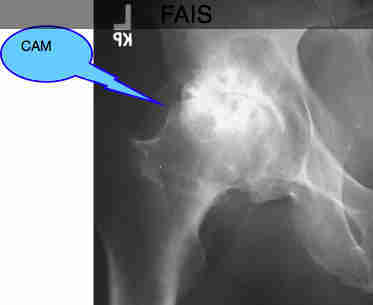 Not arthritis at all but Femoro Acetabular Impingement Syndrome or FAIS. Happily today she confided that, after eight Chiropractic Help treatments she has absolutely no lower back pain, and the groin pain is 95% better. She still gets occasional unexpected stabs but can walk normally and has no night discomfort. The secret is sacroiliac joint treatment and painful cross friction of the capsule. That, plus mobilisation of the hip and a vigorous exercise programme directed at the lower back pain and strengthening the groin muscles. Today we concentrated on the Kegel exercises which are so helpful for strengthening the deep pelvic muscles. Are you on post menopausal hormone replacement? Incontinence is likely, not to mention breast and uterine cancer. Is it really worth it? Plus, she confided, her shoulder muscles were vastly improved. She had all the signs of a progressive frozen shoulder at the initial consultation. Femoro Acetabular Impingement Syndrome comes in two forms. CAM and Pincer. Most people suffering from the condition actually have both, but she has only the the one deformity; as if that wasn't enough, groin pain. Very treatable with Chiropractic help. The answer to my initial question? In my opinion the primary is in the hip. That's what set up her lower back pain. For another, more detailed and interesting case, see our Chiropractic Help newsletter # 31. Scroll down to the bottom of this page. 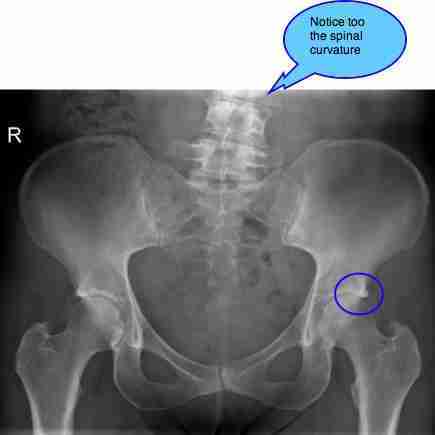 For a slightly different angle on this not common problem go to this site; femoro acetabular impingment syndrome; again, use the Site search function. A few reflections on groin and upper thigh pain. More information on femoro acetabular impingement syndrome.